You’ve decided to get a new patio. It’ll be a great place to entertain and relax for decades to come. But have you considered your patio lighting? It plays a critical role in your enjoyment of your new favorite spot. We’ve got a few tips and tricks to consider when lighting your patio. Pendant lights work well for patios and provide more light than wall-mounted sconces. An unusual and interesting pendant light can turn your patio into a statement piece. You can also add a dime switch to help control the amount of light shown. Under-stair lighting can be an attractive and simple way to highlight stairs and prevent falls. If you have just a couple of stairs, or narrow stairs, it can be easy for guests to miss a step and trip in the dark. 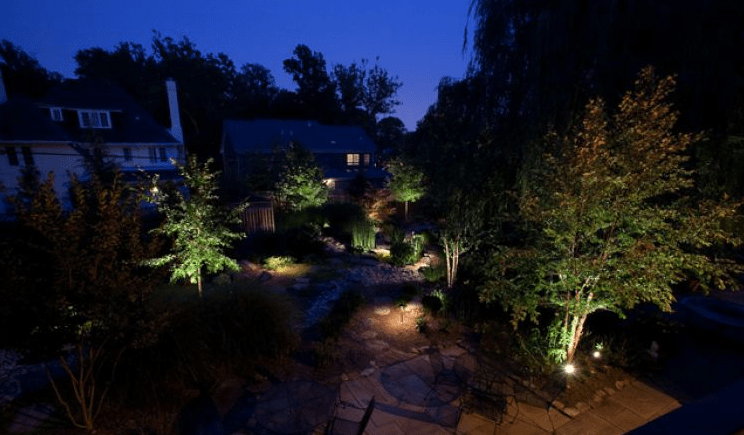 Landscape lighting can complement your patio lighting and light the way from the patio to the grill, the garbage can, or the garage. Solar-powered landscape lights are an eco-friendly option; path lights can helpfully keep family members and guests on the walkway and off the lawn. Exterior outlets are a wonderful way to enhance your patio with string lights, lanterns, and other devices. Even if you plan to wire lights, have an electrician add exterior outlets to your home to increase your patio’s versatility. Motion-sensing lights offer homes a measure of security and can keep would-be burglars away from the home. When you’re having your new outdoor patio lights installed, consider also adding in a motion-detecting light. To save money and get the most from your patio lighting, put your lights on a timer. This way, they’ll automatically come on at the pre-determined time and go off when they’re not needed, saving you money.